Kurt and Kelsey are a couple who would seemingly not have very much in common. Kelsey is a very soft-hearted woman who would die for any of the animals in her shelter. She gives everything that she has to them and with that devotion, she also makes an incredible friend. When she is asked to head up a rehabilitation program for a dog fighting ring, she doesn't hesitate. Kurt is just coming home from being deployed. He has been a dog handler his entire career and lost many friends. With each loss, a little part of himself was lost too. When he comes home and is asked to help rehabilitate some fighting dogs and get them ready to be adopted, he balks at first. He came home to lose himself in work but wanted to stay away from the dogs. Kurt and Kelsey's relationship was very slow burn. They took their time and despite the communicating hang-ups that Kurt has, it seems that Kelsey is very intuitive. However, the love story was not very fluid and seemed at times to drag on for a while. Also, the book was a lot about the dogs and less about the romance. I think that my final issue is that it seemed to end very abruptly. But, in saying all of that, if you're a dog lover, you're going to love the personalities of all of the animals involved. The kindness that each character displays for them is truly admirable. I wonder if Kurt's longtime friend, Tess, will get her own story next? 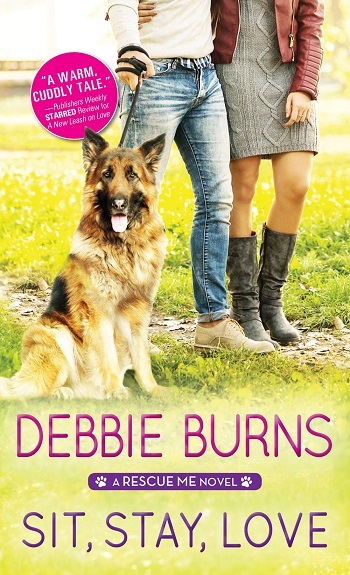 Reviewers on the Wicked Reads Review Team were provided a free copy of Sit, Stay, Love (Rescue Me #2) by Debbie Burns to read and review.